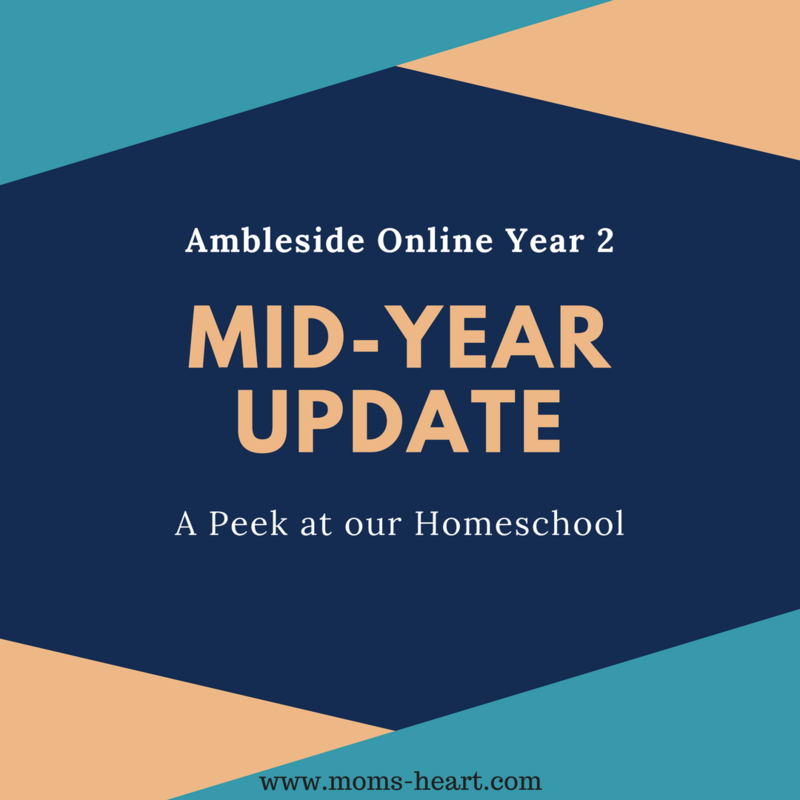 We are now coming to the halfway point in our first year with Ambleside Online! It felt like the first term lasted forever, but I think that was because we switched in October and had both Thanksgiving and Christmas breaks in there. I finally feel like we're making forward progress, a daily rhythm is falling into place, and the days are going much smoother. 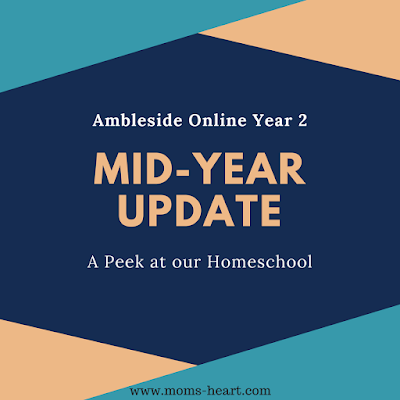 I recently shared some of my thoughts on the curriculum as a whole, but now I wanted to go more in-depth about each year and how we're handing each subject and individual books. I think I'll start with Year 2. This is my nature-loving kid, and he didn't care either way for history last year. This year, he loves it, and it seems that his history books and the subject as a whole now rival science for favorite books and subject! I would not have guessed that coming into the program, but I am happy to report it! I found Our Island Story Monarchy Timeline Cards online at one time, and I just printed and put them in his notebook, so he can reference. (We aren't doing a timeline yet...shhh!) For his notebook, I found some maps through the forum, and printed those for reference too. Sometimes we'll pull out a drawing book and do a tutorial for a castle or a knight or something relevant to what we've been reading, and put that in his notebook as well. I also have a Famous Figures from Medieval Times PDF coloring book, and he will do a coloring page from there occasionally. It must have been a freebie in a homeschool bundle, as I cannot find it on their website. I leave these types of activities up to him--I don't want to turn it into busywork, but it does give him some portfolio fodder. I typically read the core books to him, though sometimes we buddy read, and sometimes I'll assign an easier chapter to him. He's starting to make connections and loves hearing about famous people/events outside of his books! Although The Little Duke is challenging, he likes it. I read this one to him. He's making a "booklet" of the main characters. He draws a picture and then we write a few details (name, age, relation to other characters) which helps him keep his narrations straight too. I saw this idea on the FB group page, I believe. I think the book finally started to pick up pace at the end of term one and I'm starting to feel invested in the story! This is one subject where I decided to combine the boys. My Y4 would have been doing a Holling book anyway, and I already had the maps and guide from Beautiful Feet Books. I decided to loosely combine the AO and BFB schedules. My Y4 loves it, but my Y2 wasn't a fan of Tree in the Trail. The map work leaves a lot to be desired; a smaller map probably would have been better. We're just starting Seabird, so we'll see how that goes. As for narrations, I randomly alternate. From the very beginning, The Burgess Animal Book was declared as his favorite book. He loves science and wants to be a zoologist or otherwise work with animals, so I knew he would enjoy it! Though the mice chapters started to get to both of us! He can read this one on his own if I need, but he prefers for me to read it because he likes to draw/color pictures of animals to go with it. He likes to keep his field guide accessible when we read too, and of course we try to look up a video of the animals on YouTube to see them in action. For his narrations, we will sometimes write facts on the back of his page. I confess. We're okay with the outdoor time and informal nature study, when weather appropriate. Not so much the formal nature study and journaling. I finally decided to buckle down, and I went through my files to find Exploring Nature with Children again. Emory loved the idea of studying a new topic weekly, but I think we're going to come back inside and do our nature journaling. While it would be idyllic to see my children sitting around the farm with their nature journals and watercolor pencils, creating lovely nature journal entries, it just doesn't happen that way. I don't know how other families do it, but it is pure chaos if we try to do school or nature journals outside. So inside it is. We were doing separate cursive and copywork, and I'm going to continue creating simple cursive pages for him to practice. However, I recently acquired Language Lessons for Children as a review item. It is rooted in Charlotte Mason's methods, and for the most part, I like everything that is included. This review is for The Old Schoolhouse Magazine website, but I'll try to get it over here eventually too. He uses CTCMath (my review) for instruction, and Xtra Math to practice facts. Both are short and sweet, and do the job. He doesn't love math, but he doesn't hate it either. He's just progressing at a steady pace, and I'm happy with that! As a general rule, we like most of the literature selections. I adored Understood Betsy, and his reaction to the treatment of little 'Lias broke my heart. He declared with passion that he would be Lias's friend, and I knew he meant it! We visited a church one time, and the "bus kids" (i.e. those from rough backgrounds) flocked to our boys - my husband and I realized it's because our boys never discriminated against them. The book was just delightful all around for me though, and I'm looking forward to this book again with the girls. For Pilgrim's Progress, I'm actually using Little Pilgrim's Progress, because I saw it mentioned on the website and we already had a copy. This version is easy enough that he could read it himself, but I'm reading it aloud, because Elliott (Y4) has never heard it and he loves it too. I typically ask Emory to narrate since it is his book, but because Elliott is fully invested in the story, I ask him sometimes too. Now, he's not a fan of Parables From Nature, because as he put it "I thought it would be good because you said it had nature in it, but..." I think this book is also the most challenging, in terms of vocabulary and syntax, so we both fumble through this one a little. During Term 2 he actually asked to drop it or replace it, so I might just switch to the modern paraphrase for the rest of the year, then pick back up with the original in Y3 and see if that makes a difference. The newest book this term is The Wind in the Willows. He remembers reading somewhere that this was a favorite book of Theodore Roosevelt, so he was interested in starting. I like how this one gently ties into science, and I definitely prefer the generic names like Mole, Rat and Toad over all the silly names in Burgess that I can't always keep straight. He took to saying Poop-Poop! for awhile, of course, and this is the first book he requests every day. We do need 2-3 reading slots each week for this one because it can be wordy at times, but it's a fun read. So these are elements listed on the Year 2 page that we aren't doing as written. Trial and Triumph - I just purchased to read through myself first, and I think we will do the alternate recommendation for church history. Foreign Language - We have dabbled in Spanish, but I have been inconsistent with it. Poetry/Shakespeare/Music - I've shared more about some of our enrichment activities already, since we do those as a family. Art/Handicrafts - I'm working to include these more. Right now we're finishing up the lessons we have from the ArtAchieve review before they expire, and I'm considering it an "all-in-one" for these categories. He expressed interest in clay and pottery, so I'm going to figure out how to work that into our art/handicraft time slot next. Co-Op - Not listed on AO of course, but it helps fulfill Art. He also has a literature and science class. Then his free time in the gym gets some physical activity as well. All that to say, Year 2 is going well. There's always more we could be doing, but it's literally one new thing at a time for me right now. I am happy with our homeschool. The kids are learning, making connections. Enjoying.